"The village of Tamesloht is a holy place in the arid lands south of Marrakech. In the moonlight, its walls resound with evocation of protective gnawa spirits. Between the call to prayer and the humming of insects, its sound universe is inhabited by sub-Saharan Africa and age-old migrations. This intimate tribute to the power of an ancient tradition divests the healing melodies of their ritual drumming. 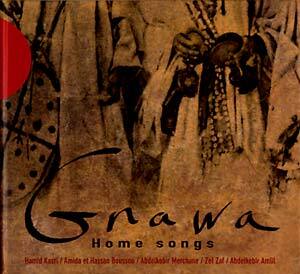 Instead, Gnawa Home Songs shines the spotlight on a number of exceptional soloists -- stirring vocalists or virtuoso players of the three-stringed guembri lute. Listen in as the old masters Hamid Kasri (who, incidentally, has played with Joe Zawinu) and Amida Boussou join forces with young stars such as Hassan Boussou, founder of the band Séwaryé. Beautifully packaged, this is a unique document of an extraordinary living tradition."